The mystery, color and romance of pre-war North Africa comes to life in Casablanca style. Inspired by the Moorish architecture of Spain, Morocco and Tunisia, Casablanca incorporates the classic design elements of Moorish-style arches, loggias, courtyards, and window openings, creating a style reminiscent of the grand stone, tile and clay architecture of the western Mediterranean. The font, with its boldness and embellishments, evokes the moorish calligraphy of the mediterranean. This is a style for a sun-drenched outdoor garden party or other event. Customize your Casablanca graduation coasters today to celebrate your hard-working grad! Casablanca graduation coasters are available in multiple shapes—3.9" round, 3.9" square with rounded corners, and others. They are extra-thick, 58-point paper board. To give you an idea of how thick they are, a stack of a dozen coasters is about 3/4" tall. They are made of absorbent pulpboard to help protect your tabletops and counters. The coaster surface is coated with a smooth matte coating to provide beautiful, crisp printing. Evermine graduation coasters are individually die-cut, so their top has a soft and rounded edge. They are designed to be disposable, but they are durable and re-usable. If unused, they can be kept as keepsakes and will last forever. Graduation coasters are printed on the front side only. On the blank back, a small Evermine logo is debossed (not printed with ink, but simply pressed into the soft pulpboard paper). 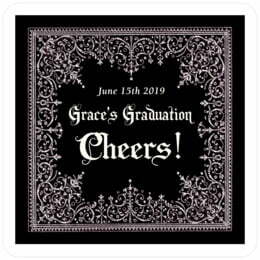 And our graduation coasters come beautifully packaged in boxed sets of a dozen; they are great to give as a gift, or simply hand them out to guests or scatter them on your tabletops. 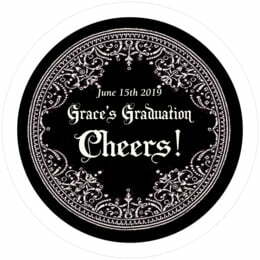 Click on "Personalize" to start customizing Casablanca graduation coasters for your graduate today!